Joe bought the business in 2003 and set about developing the business from a two person operation to the fast paced environment that Threlfall Packaging is today. Originally from a property sales background, Joe brought with him many years of sales experience. This expertise coupled with a focus for high levels of customer satisfaction has seen Threlfall Packaging become the first choice for many customers when it comes to their packaging needs. When he’s not working Joe enjoys a hectic family life with his 3 daughters and wife Simone. Tommy joined the Threlfall Packaging team in 2005. Coming from the healthcare sector Tom brought nearly 20 years of experience in warehousing/stores and janitorial processes to our organisation. This experience means that customers can rely on getting their orders in a timely and efficient manner. A keen North Melbourne fan Tom was also a legendary local cricketer. Although now retired Tom’s spare time is spent with his wife Tiff and young son’s Jack & Harvey. Brett joined our team in 2008 and was able to provide first hand experience of the Hospitality industry having owned one of Bendigo’s busiest Café/ Restaurants for many years. A change of career path for Brett meant that we now had someone on our team who truly understood the industry and what Chef’s and Business owner’s needs were and how they could be met. On weekends Brett enjoys a game of footy with the Marong Panthers and spending time with Partner Sarah and their two girls. An experienced campaigner best describes Jeff! With over 20 years customer service experience as well as 8 years in the hospitality packaging industry Jeff came aboard in 2009. With this wealth of experience Jeff knows what customers want and how important good service is. A fanatical Collingwood supporter, Jeff enjoys a night on the couch with his five children and wife Chantelle watching them play. As you can see the Threlfall Packaging team is all about family! 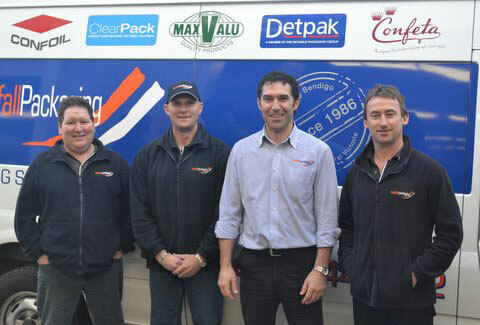 We’re a family run business looking after family run businesses. With this common thread binding our team together you can rest assured you’re in great hands! !